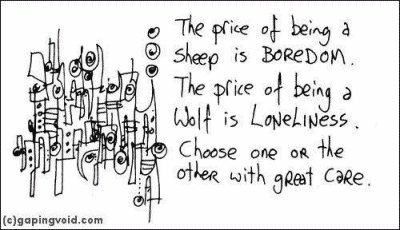 Choose wisely – sheep or wolf? Posted on 2008/09/21 2013/12/06 Tags TabulaRasaLeave a comment on Choose wisely – sheep or wolf? The eternal vagabond feels little ambivalence leaving. Universcale [original with music] provides a graphic comparison of the size of various entities, those which we can see and those which we cannot. The presentation is very interesting and provides comparisons of objects visible via an electron microscope or an astronomical telescope.